A chocolate lover's dream! We carefully nestle a 1/2 dozen Extra Fudgy Chocolate Chunk Brownies, 1/2 dozen Classic Cake Style Brownies, 1/2 dozen Death by Chocolate Cookies (a gift basket exclusive! 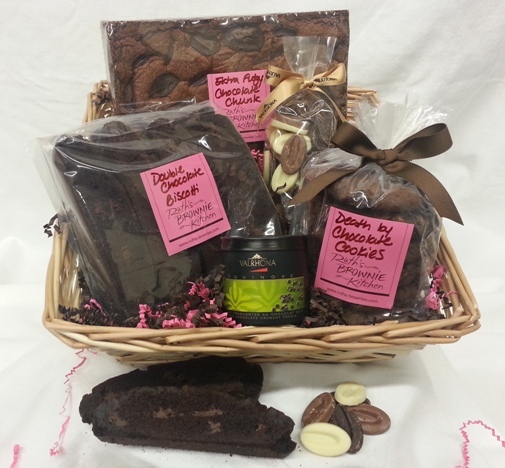 ), 1 dozen Double Chocolate Biscotti in a wicker basket and garnish it with grosgrain ribbon. A selection that is sure to send a chocolate lover to seventh heaven!